A story about a teen, his machine and the unforeseen. 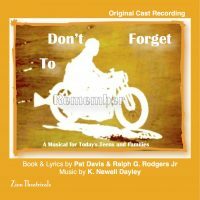 This contemporary musical deals with the communication problems between parents and youth; and how each party has responsibility in the matter. A motorcycle crash enables a young man to travel back in time and unknowingly receive the counsel that he needs from the Apostle Paul; once awakened in his hospital bed he remembers that counsel and uses it to help him solve his problems. Will It End This Way? From this website through our PayPal Shopping Cart for the internet special price of $10.00 (+shipping and Maine sales tax) Be sure to enter your zipcode where prompted on the PayPal order form. It will automatically calculate the shipping for your order. If you are interested in producing DON’T FORGET TO REMEMBER onstage click HERE.